It all seemed like history repeating itself. 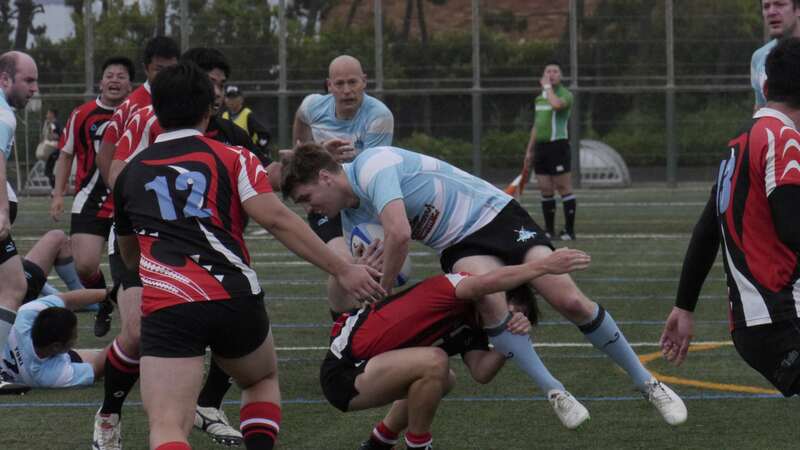 Last year we had turned up to the final table game against the Yellowbacks at the Rinkai ground with a team that consisted mainly of forwards – so much so that our back line featured a prop and two flankers by the final whistle. This year, we wouldn’t have to start with any forwards in the back line – but we didn’t have a single substitute for the backs, and this would be our undoing. Swift were always going to be our toughest game of the group. They have beaten a solid Crusaders team in the past, and they secured their position into the Shuto league next season with ease. We lined up a against a young, fast looking team at the pre-match and Swift were looking very confident, especially since we had an average player age of around 10 years older. What followed from the Crusaders, was the most spirited game of rugby I have had the pleasure of playing in this season. The Cru defence was constantly under siege at the beginning of the game. However, the line could not be broken. Players were covering the pitch effectively and soon Swift were losing their pre-match confidence. With some turned over ball through the combination of big hits, effective rucking out, and being quick to jump on or kick through loose ball, the Cru were in the opposition half. With a penalty in the opposition half, and a very dodgy kick from myself (bouncing off their player and out), we had a lineout on the opposition 5. Unfortunately, we would not convert that opportunity, and this was the case for much of the game – while we were looking great in defence we never really looked like putting points on the board – either through handling errors, or fate conspiring against us – we were not getting over the try line. We would hold onto our clean sheet through to the end of the first half though. As the second half got underway, Brett continued to lead by example with some incredibly physical tackling and Shogo followed suit. David Limin and Tim combined nicely, with David carving through the line – again the line break just wouldn’t be converted into points. Tiredness began to take its toll and tries were scored round the outside of the backs. But the Cru were still in it until, while making another monster tackle, Brett’s nose went on a migration to the other side of his face. The captain was off, and despite best efforts, heads went down. The Cru continued to hold out as best they could, but another couple of tries left us with a final score of 17-0 to Swift. The game was played in excellent spirit – fair but physical, and I am really looking forward to meeting Swift in the Shuto League next year. I would like to say a big thank you to the support staff on the day, many of whom have been regular support staff throughout the Tokyo Cup campaign. Also, welcome back to Dylan – we look forward to seeing you out on the pitch again next season.